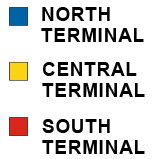 The Airport is divided into three terminals: North (Concourse D), Central (Concourses E, F, and G) and South (Concourses H and J). The Terminal Building has 225 active concession locations occupying approximately 280,132 square feet of duty-free, food and beverage and retail space; there are 11 locations temporarily closed to due to Airport construction. Approximately 30% of the concession locations are located pre-security and approximately 70% of the concessions are located post-security. The Terminal Building also provides locations for services such as advertising, banks and ATM machines, currency exchanges, baggage wrap machines, luggage carts, and baggage checkroom. The Central Terminal Retail Program solicitation is being planned for a late Spring 2019 release. It is intended that this program will provide concession services on an interim basis while the permanent Central Terminal Redevelopment Program is being designed and constructed. The majority of the concessions are located on the pre-secrutity side of the Terminal Building. The South Terminal is supported by a 50,000 square-foot Concession Hall and features an 8,900 square-foot food court. The South Terminal also includes a Bank of America service center and other amenities, such as ATMs and currency exchanges. 60 permanent concession locations are open and include such prestigious stores such as Michael Kors, Victoria's Secret, Hugo Boss, Desigual, MAC, Coach, Tumi and Tous. 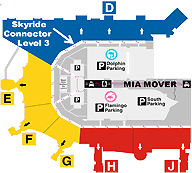 The North Terminal represents 61% of the total passenger traffic at MIA. The North Terminal has 147,302 square feet of space represented by a total of 108 concession locations, including the Miami Marketplace, a series of modular units offering food and merchandise that represents the South Florida market. Nationally and internationally recognized concessionaires offer branded concepts at market basket prices. Local retailers feature a diversity of South Florida products. MIA represents the eclectic cosmopolitan community it serves with a sense of place, excitement and diversity. Improvements in the passenger terminal areas and the opening of state-of-the-art facilities now form part of the new MIA. For information regarding the Concessions Program, please check the Airport Contact Listing. New Business Opportunities are offered as the implementation of the Concessions Program moves forward. Please check Opportunities and Advertisements for upcoming solicitations.